Flow Focusing Inc. is a research and development company based in Menlo Park, California dedicated to out-licensing a novel technology for economically creating monodisperse, micron and sub-micron simple and micro-encapsulated particles in high volume for a variety of applications. Flow Focusing Inc. seeks to work with licensees to help them customize the Flow Focusing technology for their particular needs. The Flow Focusing technology was originally developed at the University of Sevilla in Southern Spain by Dr. Alfonso Ganan-Calvo who is Professor of fluid mechanics at the University where he received his degree in Mechanical Engineering in 1986 and his Ph.D. in 1989. Dr. Ganan Calvo received the Smoluchowski Award in 1998 for his outstanding work on producing uniformly sized nano particles. The University of Sevilla has granted an exclusive license to all applications of the technology, other than those relevant to pulmonary drug delivery, to Flow Focusing Inc. Scientists at the University of Sevilla are working closely with Flow Focusing Inc. to demonstrate the applicability of the technology to solving specific problems in a variety of industrial areas. Questions regarding Flow Focusing Inc. should be directed to Karl Bozicevic, President, Flow Focusing Inc., 200 Middlefield Road, Suite 200, Menlo Park, California, 94025 (Tel: 650 462 1440; Fax: 650 327 3231; KarlBozicevic@flowfocusing.com). The Flow Focusing technology relies on a new observation relevant to the physics of fluid mechanics. Specifically, that a funnel shaped lens of gas is created when a flowing gas produces a pressure drop across an orifice. 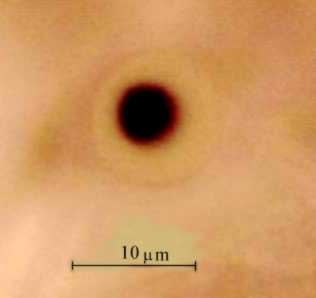 By introducing a flow of liquid into the mouth of this funnel, a steady, thin jet of liquid is created which rapidly breaks up into small droplets of very similar size. Because the liquid is guided by a lens of gas, the liquid jet never touches the hole through which it flows. In fact, the hole size is selected so as to create a desired pressure drop at an optimal gas flow and can be many times the diameter of the liquid jet. Although the funnel is invisible, its presence can be experimentally confirmed by aiming the liquid flow away from the center of the hole defining the location of the funnel shaped lens of gas. 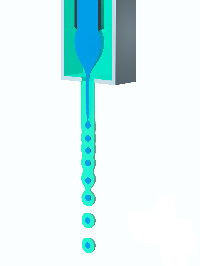 The liquid appears to efficiently find the hole by bending through space. Actually, the mouth of the funnel of gas is broad enough to guide the liquid flow into the proper position. Micro encapsulated spheres can be created by using concentric nozzles. 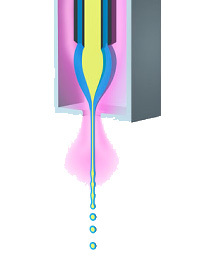 The ecapsulating fluid is shown here in blue with the material being encapsuated shown in yellow. The videos show micro encapsulated sphere production using a UV curable resin surrounding black ink with mineral oil used as the focusing fluid. The sphere production rate has been set to about 1kHz by mechanically coupling an acoustical speaker to the production nozzle. Although the produced spheres are moving at about 1 meter/second, they appear frozen because their production rate is a multiple of the video camera sampling frequency. An actual Flow Focusing head consists of a nozzle and an enclosing chamber used to generate a pressure drop across an orifice. 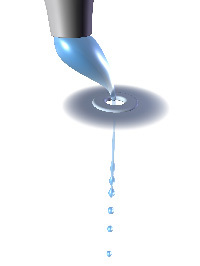 In this example, monodisperse droplets created from a single liquid can be continuously generated. 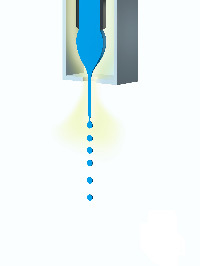 Because the liquid does not touch the sides of the exit hole, system failure due to clogging is reduced or eliminated. Concentric nozzles can be used to create complex particles from two liquids or from a liquid and a gas resulting in the production of hollow spheres. The Flow Focusing physics is symmetric with respect to the role of liquid and gas. 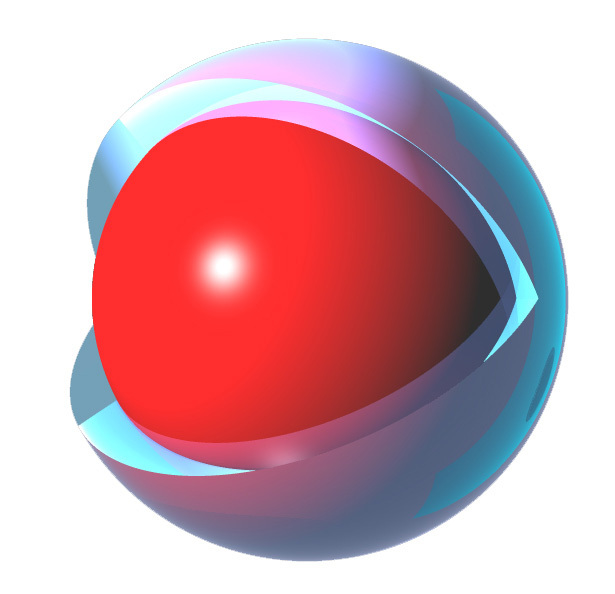 A funnel shaped lens of liquid can be used to create microencapsulated spheres. This method is an alternative to using concentric nozzles and may be preferred when the compound spheres are being generated into a liquid environment. This approach can be used to create microbubbles of gas in a surrounding fluid. The Flow Focusing technology can be scaled up by replicating an arbitrary number of Flow Focusing heads into an array structure. Such an arrangement can result in reliable, economical large scale production of monodisperse simple and microencapsulated spheres. Because the liquid jets do not touch the exit holes, long term, low maintenance operation of such a system is possible. The Flow Focusing technology was used here to make capsules of polymerized (clear) DuPont SOMOS 6200 resin surrounding black ink. Concentric nozzles were used to introduce a stream of ink within a stream of resin into air. 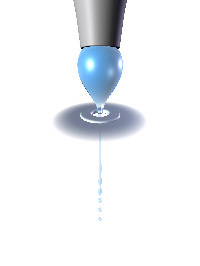 The resulting droplets were cured "on the fly" by surrounding UV lamps. Three dimensional artist's depiction of the microencapsulated sphere shown in the photograph on the left. The Flow Focusing technology can also be used to generate microbubbles of constant size. 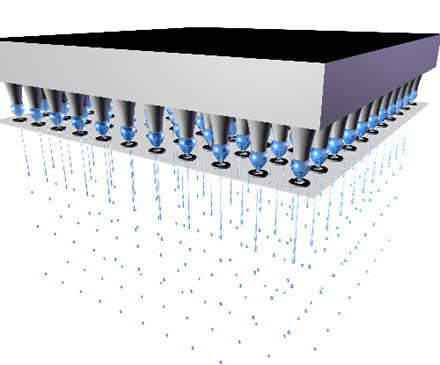 In the above demonstration, 60 micron air bubbles of uniform size were made using 15 kPa air pressure through the nozzle and a focusing fluid consisting of 20% ethanol and water exiting into water. Flow Focusing Inc. seeks to negotiate field specific license agreements with partner companies interested in the technology. Flow Focusing Inc. has an exclusive license to the Flow Focusing technology in all fields other than pulmonary drug delivery. Parties interested in licensing the technology for pulmonary drug delivery should contact Aradigm Corporation. Flow Pharma and Flow Fiber have licensed the Flow Focusing technology for pharmaceutical development and optical fiber fabrication applications, respectively. For information regarding Flow Pharma or Flow Fiber please contact Dr. Reid Rubsamen, Flow Focusing Inc., 200 Middlefield Road, Suite 200, Menlo Park, California, 94025 (Tel: 650 462 1440; Fax: 650 327 3231; ReidRubsamen@flowfocusing.com).